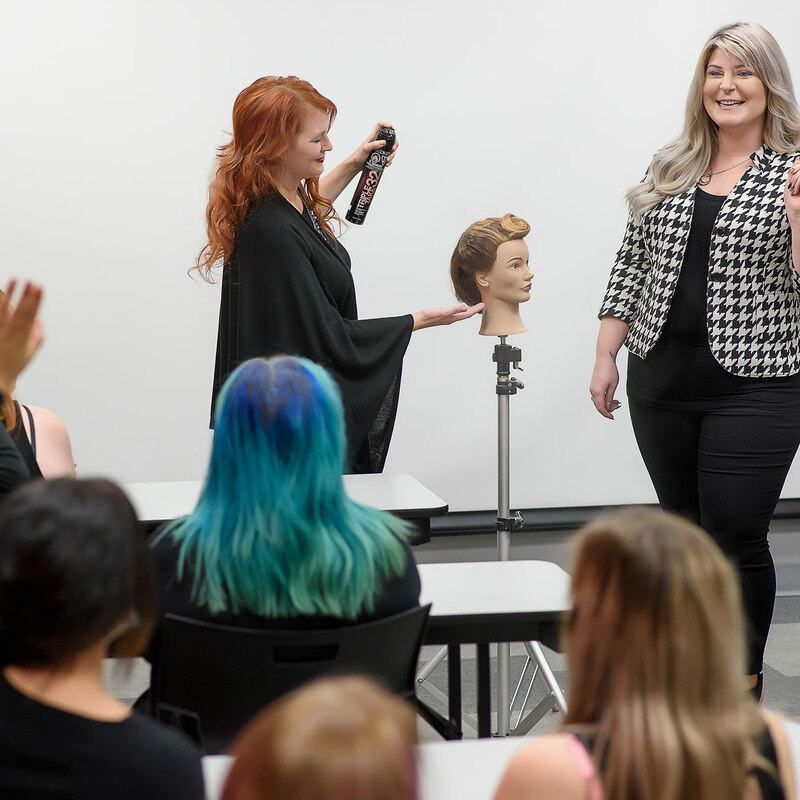 Choose a Hair, Esthetics or Makeup Diploma program from the HDC—one of Atlantic Canada’s most respected cosmetology schools—and get the training and tools you need to turn your passion into a thriving career! Imagine how great it will feel to go to work everyday and help your clients look and feel their best. When you follow your passion and choose a career in hairstyling, makeup and esthetics, you’ll be able to help people feel confident and look their best every time they see you. Esthetics, Hair and Makeup Programs at the HDC are designed to give you the training you need to reap the rewards of a career in this industry. The HDC is recognized as one of the premier cosmetology schools in Atlantic Canada. Each program has been carefully designed to offer students more than just in-classroom training. 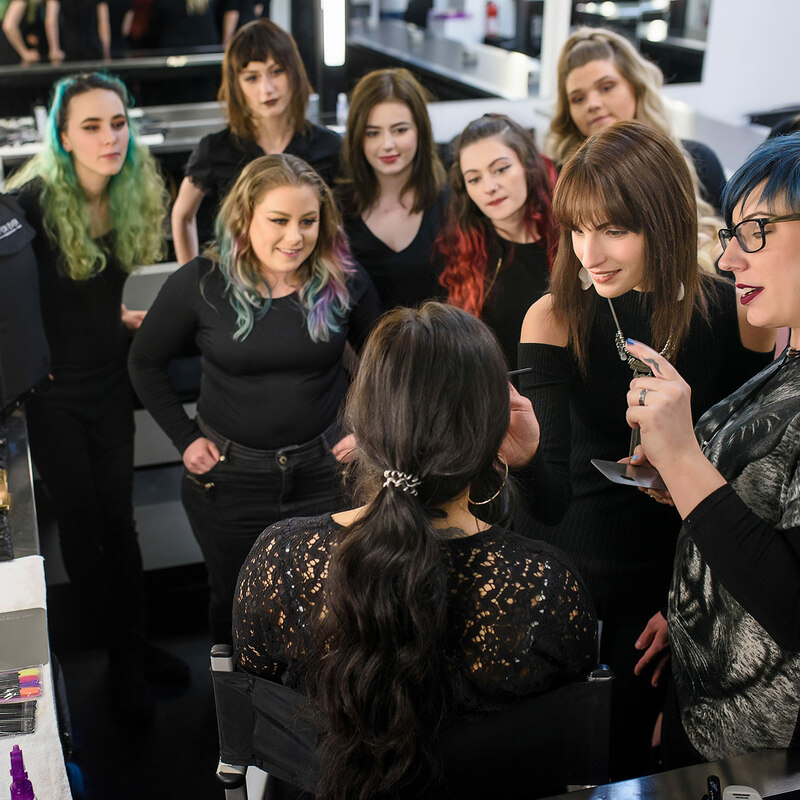 Hair, esthetics and makeup students at the HDC learn the fundamentals of their craft and develop a solid foundation in all the skills required to thrive in busy salon and spa environments. You’ll learn how to develop and grow relationships with your customers because we know this is a key to your future success. You’ll also learn how to build your business and optimize your earnings—something that many programs don’t cover. Your education is delivered through an innovative online learning environment, Pivot Point FUSE, designed specifically for the beauty industry—the only one of its kind! Pivot Point FUSE is a ground-breaking integrated social learning environment, built specifically for you and the beauty industry. An incubator for talented future and current beauty professionals, FUSE combines best-in-class educational content, creativity and a collaborative environment to enhance personal learning experiences. You have never seen anything like FUSE before. It’s the ultimate learning environment within the beauty industry. It’s easy to use and contains all the features necessary to capture your attention, inspire creativity and allow you to share your experiences with your peers. Pivot Point educational content is at the core of your FUSE. The lessons are brought to life through a synergy of communication, collaboration and engaging activities. Plus, there’s a bit of competitiveness, too! • Show the World Who You Are—Personalize your profile to let others know who you are, what inspires you and show off all your work. • Become Part of a Community—You’ll have access to your classmates, and so much more; you’ll be in touch with everyone who is connected to your organization. Network, share and inspire! • Not Connected? No Problem.—Study anytime, anywhere, our downloadable eBooks and study guide don’t need an Internet connection for you to access (once downloaded). • Organized Learning, Bit by Bit—Lessons have been carefully segmented into smaller sections to provide you with the most pertinent information necessary, when you need it. Whether you’re in the classroom, or somewhere else brushing up on your skills, you can access videos, eBooks, study tools, interactive activities, collaborative peer-driven exercises and fun, engaging assignments. • Compete—Like to show off? Well, you can in FUSE! You will get points for almost every action you take. Login, get a point, finish a lesson, get lots of points; the top five in your community are showcased on the leaderboard on the home page for all to see. • Ready, Set, Test—Okay, so now you’ve completed all your lessons, gained tons of practice on the clinic floor and are almost ready for that licensure test, we’ve got you covered with Exam Ace in FUSE. Exam Ace provides you with lots of tests to get you ready to take your exam. Take ‘em as many times as you want, no need to download apps or go elsewhere! As part of your training, you’ll have the chance to earn real-world experience in our fully-equipped salon and spa. You will have countless opportunities to practice your craft on real clients so when you graduate, you’ll be prepared to enter the salon world based on your hands on experience at the HDC. Plus, thanks to this unique experience, our hair and esthetics students enjoy a 90% job placement date within 30 days of graduation. Ready to love what you do? Apply today! Why Choose the HDC for Cosmetology School? We are proud of our programs’ 90% job placement rate. The HDC is part of the Salon Resource Group—the largest employer of hair, makeup and esthetics talent in the Maritimes. Upon graduation, many students are able to achieve employment at one of these locations, further contributing to the success of our graduates. Our Hair Design Program offers you a great foundation in all the essential skills you need to thrive in your career, including hair cutting, colouring, and specialized treatments like hair extensions. Additionally, in your 1,500 hours of studies over 10 months in our hair school and salon, you’ll get important training in business development, customer relationship management, time management and finances. You’ll even study client psychology to learn how to connect and build trust with clients. Students in the HDC Hair Design Diploma Program graduate with excellent technical skills, knowledge on how to build their business, and expertise on how to optimize earning potential as a stylist. You’ll graduate with the confidence you need to get your career off to the best possible start. More importantly, you’ll be ready to use your passion to help your clients feel self-assured and positive. Apply for the Hair Design Program today! The HDC Esthetics Program offers students the education and training to deliver high-quality services to clients in our onsite cosmetology school and spa. You’ll also develop the critical skills required to thrive in the exciting, growing field of esthetics. You’ll graduate with a wealth of knowledge about how to use your love of beauty to make your clients feel special and confident every time they leave your treatment room. Throughout your studies, you will learn how to provide skin therapy services, hair removal, makeup techniques, nail services, eyelash extensions, and much more! At the same time, you will also study other key areas, such as skin sciences and general anatomy as well as chemistry and infection control. During the 10 month program, you will develop business building skills such as clientele retention, career planning and how to approach product recommendations. Thanks to the solid foundation and access to the HDC’s full service spa, graduates of the Esthetics Program will graduate with the skills and the confidence required to begin a successful career. Apply for the Esthetics Program today! The HDC Makeup Artistry Program is like no other—and neither is a career in makeup artistry! Offering amazing flexibility and the opportunity to use your passion to create stunning looks for clients’ special occasions, or something extraordinary for film or photography, makeup artistry is a fabulous creative outlet. Thanks to the solid foundation it provides in application combined with education about client consultation, and the business of makeup artistry, this unique program opens up wider opportunities in industries like photography, runway and stage, music video, boutiques, salons and spas. Don’t wait to find out why a career in hairdressing is worth investigating for any millennial. Get the guide today. 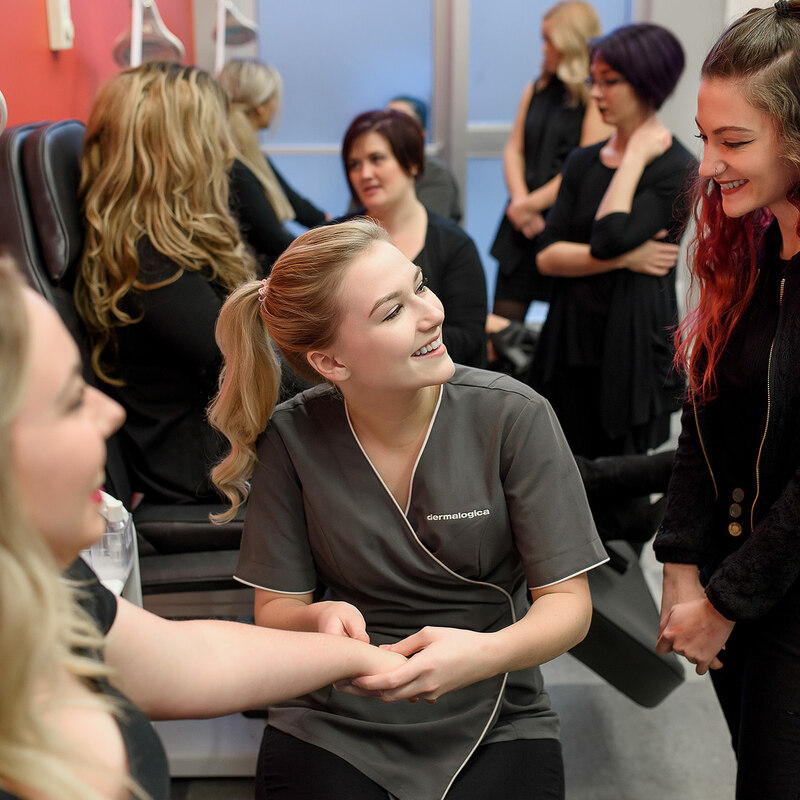 As Atlantic Canada’s premier cosmetology school, the Hair Design Centre is part of the Salon Resource Group: the largest employer of hair, makeup and esthetics talent in the region. When you choose the HDC, you’re choosing to start your training (and possibly begin your career) with a dynamic organization that’s been providing the highest quality salon and spa services throughout the Maritimes for over 50 years. Many of our students are able to start their careers straight out of the gate at one of the Salon Resource Group salons and spas, where ongoing training and development are a core focus for our team members. Don’t wait any longer—apply now!